Mangaluru, Mar 30 2019: Rivers and their sources are sensitive areas and human meddling should be prevented . The sources can be saved only by preventing the projects that are dangerous to Western Ghats, Environmentalist Dinesh Holla stated. 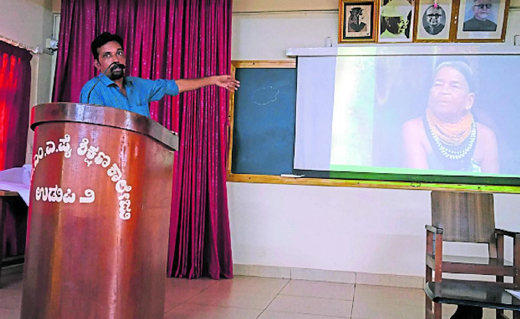 He was delivering a talk on ‘River Diversion and Interlinking of Rivers’, at TMA Pai College Udupi. Holla described the trend of resorts and home stays coming up near the sources of the rivers as a dangerous trend. “The rivers are drying due to unscientific projects implemented in the name of development,” he lamented. A building can be reconstructed. However, if the sources of a river are destroyed, it can never be revived. “If river diversion project is implemented in Western Ghats then the entire coastal region will face drought, he warned. On forest fires, he said forest fires were man-made. A forest fire in Western Ghats destroys the grass on the top of the hilly ranges. As a result, when the region gets rain, water does not get percolated into the earth and dries up the sources of water. We should ensure that forest fire does not occur, he stressed. The government is implementing river diversion project without implementing a scientific study on the availability of water in the river.